All of this information about Jones can be easily found or substantiated online. Had Zurawik bothered to do even cursory research on Jones before he began hurling insults, he may have realized that going after Jones' credentials wasn't the smartest move. 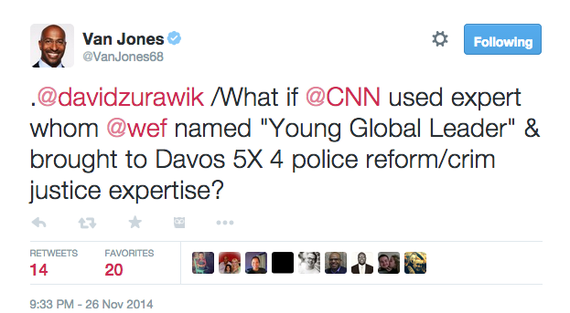 And as for "kids in college studying journalism" being more qualified than Jones to do reporting? 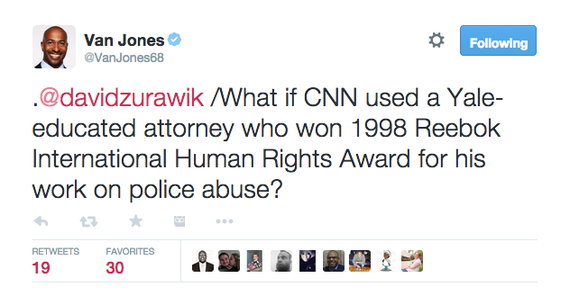 It turns out that Jones has a degree in journalism/communications. After which, he spent some time working for a small, obscure news organization -- the Associated Press. In addition to straight reporting, there was a serious need for analysis and commentary that night. Jones' expertise and experience made him more than qualified to provide it. Furthermore, he was an informed eyewitness, in the middle of the action. His contributions were a legitimate part of the coverage. One might easily turn the question around: Why did the Baltimore Sun and NPR feature a media critic like Zurawik who appears to have done "no homework" before launching his attacks? I was particularly troubled and offended by Zurawik's diatribes, especially at a moment like this. Zurawik's insults had too much in common with the standard line of attack on high-profile African-Americans -- that they are "not qualified" for their jobs, in the first place. After Jones earned his degree from the Yale Law School, he spent 10 years working on criminal justice issues -- winning numerous victories and awards. He is uniquely qualified to help contextualize the events in Ferguson. And sure enough: Throughout that tragic night, Jones consistently made observations and drew connections that few others were making, offering his viewers unique insights. CNN won some of its highest ratings in recent years for its coverage of events in Ferguson -- even surpassing Fox in the coveted 25-54 demographic. Kudos to Van Jones and the team at CNN for their strong coverage, representing diverse perspectives in this complex and difficult situation. 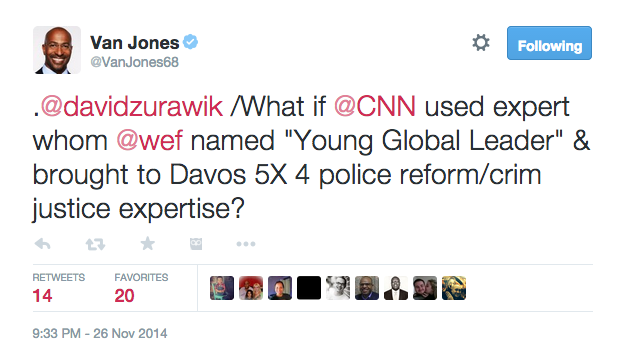 One expects right-wing bloggers to take pot shots and try to undermine the validity of voices like Jones'. One expects better from esteemed outlets like the Baltimore Sun and NPR. It would seem appropriate and a sign of decency for Zurawik and his newspaper to retract those inaccurate statements and issue an apology to Van Jones. 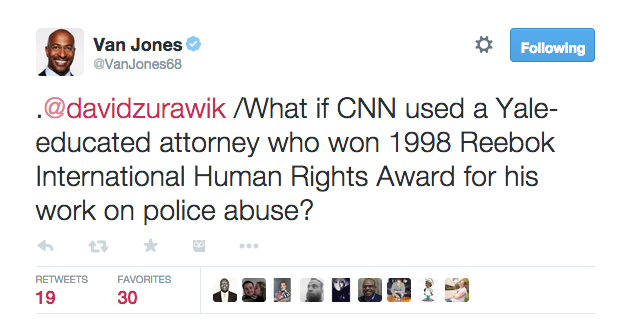 In a final nod to Jones' credibility, NPR should have him on to discuss this media fail.